The Vamps Source, as the name implies, is a big fan website that posts the latest news regarding tours, new albums, and all other things related to the British pop boyband called The Vamps, to the delight of the many Vampettes and Vampions all over the world. The site’s following has gone global that, on their 3rd anniversary, their giveaways will span out over 4 consecutive weeks through Twitter, and using the hashtag #TVS3years. These giveaways consist of branded headphones (from British Audio), wristbands, and The Vamps albums with the band’s autographs. Most of all, the brand can garner more subscribers since they are using the social media to promote the giveaways. The pop group probably has fan groups in almost every country, and, if we base it on how fans usually react to their idols, the brand can expect that more people will want to have any of these freebies for themselves. Aside from that, the importance of the brand will powerfully increase because their co-fanatics will see that they can do more than just say, “Thank you for following us.” No, they have the means and the effort to send giveaways too, which is highly commendable. Check out our blog to see more promotional ideas for your brand's anniversary. The world has first heard about The Revs, or the York Revolution professional baseball team, in 2006 as a part of the Atlantic League. Aside from winning the league championship for two times now, they are also known as the baseball team that pioneered the acceptance of Bitcoins – electronic money – as people’s payment for their game tickets. This year of 2016, they are going to commemorate their 10th anniversary through the Celebrate York series, in which they will give away bobblehead figures depicting some of the most influential people from York, like Governor Tom Wolf, Chris Doleman and Bruce Arians, as well as welcome mats, T-shirts, caps, and magnets, every Friday home game of the current season starting this April 29th and ending on September 16th. Outpouring Brand Support. Fans want to see their favorite baseball team to win every match surely, but they will have another reason to come to the game because of the promise of getting these promotional giveaways that, in time, will make perfect collectibles. Bigger Brand Visibility. Events like this sometimes turn into family or friends’ bonding place, especially if they all love baseball. This simply means that more tickets will be sold, more people can come and see the game, and more non-believers can turn into super fans in no time. Great Brand Placement. 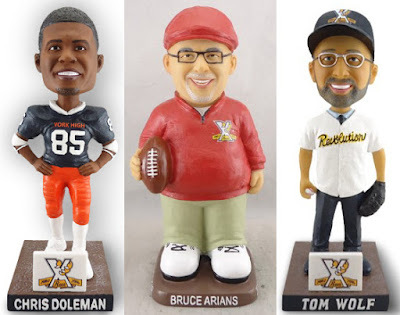 The promotional bobbleheads show honorable York figures wearing branded caps and other items, that’s why the brand name can be easily singled out wherever the receivers of the freebies will place them. Don't leaving your followers hanging just because you have no clue about the cool giveaways today are. Visit our blog for more information.